The 154 piece Mechanics Tool Set includes 93 sockets in 1/4, 3/8 and 1/2 in. drive sizes, both metric and standard sizes, deep and standard depths. 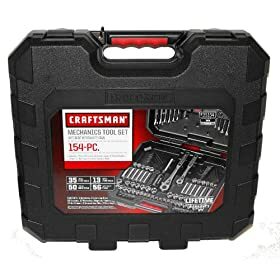 The set also includes (12) 12pt combination wrenches in metric and standard sizes, 3 quick-release ratchets (each drive), 2 extension bars and 44 specialty tools. The Mechanic's Tool Set comes in a convenient and portable briefcase style plastic carrying case.